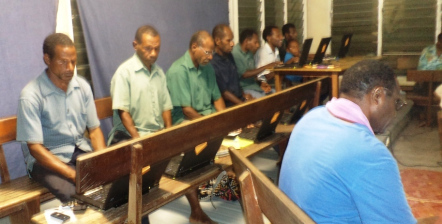 I started to write this article on the final day of the basic computing course for Madang Evangelical Brotherhood Church (EBC). 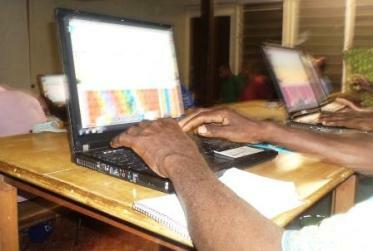 This particular training brings the total number of BCT’s offered this year to nine. Four were cancelled or delayed due to conflicting dates of various churches with the 2015 LTPNG ministry plan. As a result we found ourselves in a situation of ongoing travel and training with a week and a couple of days in the office. At this point in my typing I pause to thank God for all your faithful prayers which keep us going; phone calls and text messages from families and individual CRMF staff members.The Lord bless your heart for supporting the team while out in the field. 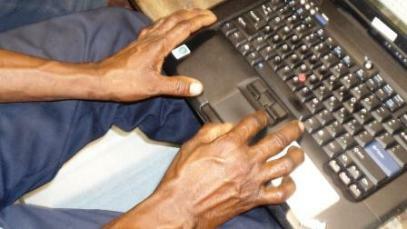 Thank you for all your moral support via the waves of technology. The continuous delivery has brought us to a point where the only strength to go on can only come from God. I reflect on the meaning of the words of Apostle Paul in 2 Corinthians 12:9 “My grace is sufficient for you, for my power is made perfect in weakness.” We are in no way like what Paul was going through when he inked this popular verse but the truth of this Scripture has helped us on many occasions to keep delivering. These courses have broaden my knowledge of the colossal need for basic computing skills for the faithful church workers in Papua New Guinea. 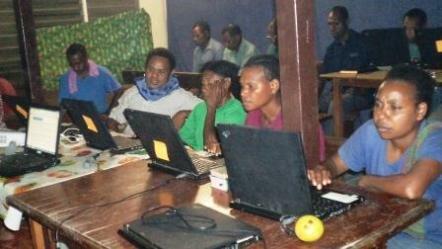 Offering them within Goroka area and other Provinces like East Sepik, Madang and Enga paints a picture of the many that will need basic computing skills. Participants working on their own projects on the third day of training. Localization of church leadership in PNG has been the major contributing factor for “breeding” technical orphans (my observation). I am pretty sure that if a survey was to be conducted my observation would be accurate to some extent. and efficient way of doing business. We thank God that he has allowed us to handle His business in the same stride as the rest of the global village. Because PNG has become a global village overnight the urgency to train and equip pastors and ministry leaders is ever pressing. The focus then is to make sure that all participants involved have a common goal and that is to see the Gospel of our Lord Jesus preached to everyone. You can be a participant to impact the ministry of the faithful pastors that attend the courses through prayer, giving, training and supporting in various ways. Our mission is to keep on praying and giving as we train and equip “the participant” who will make an impact for the soul that needs saving.